Best Uptime, a Real Premium Web Hosting that is affordable. I’ve been paying for and reviewing HostGator Cloud for more than 33 months. During that time, I’ve carefully monitored and recorded all of the important metrics and data points, such as their load time, uptime, and customer service responsiveness. Over the course of this review, I’ll be laying out all of the objective statistics regarding my time with HostGator Cloud as well as taking a deep dive into the providers pricing, extra features, and support staff to help you determine once and for all if they are the right hosting provider for you. If you’ve never heard of HostGator WordPress Cloud hosting, you’re not alone. HostGator’s cloud hosting package has successfully been flying under the radar for months and I didn’t hear about it until EIG (the company that owns HostGator, BlueHost and several other hosting providers) reached out to me personally requesting that we review their new hosting service. I didn’t have high hopes for this review. After all – their low cost shared hosting option (ranked #11 of 30) didn’t exactly inspire confidence in HostGator’s services. Our high-performance managed WordPress platform bundles scalable cloud hosting and robust functionality, empowering your sites to run faster and more securely than ever before. Load pages at blazing speed worldwide without having to configure your caching and CDN. So what does this jargon-filled statement mean? In short, they promised 2.5x faster load times among other improvements. But we had to be sure! Instead of using the account that they had already set up for us (to avoid receiving any special privilege that would bias this review), we decided to whip out our credit cards and pay for a real live plan under an anonymous Gmail account. After that, we set up a default WordPress site, integrated several performance tracking applications, and started monitoring HostGator’s performance. After more than a year of monitoring the site’s performance, we’ve compiled a review detailing the good, the bad, and the ugly (Hint: there was no ‘ugly’). All of the bells and whistles that come standard with most hosting services are useless if the servers can’t deliver reliable uptimes. In the past, I’ve been incredibly disappointed by HostGator’s basic plan. Their cloud hosting service isn’t just playing in a different league. It’s a whole different ball game. Although HostGator Cloud’s uptimes have slipped a tiny bit in recent months, dropping from a perfect 100% to 99.97% (0.03% better than the industry average) their stats are still impressive. With only 2 hours of downtime over the course of this review and a total of 36 outages, HostGator cloud is the eleventh most reliable host that we’ve ever reviewed and they don’t seem to be slowing down anytime soon. When choosing a web host, uptime is THE #1 statistic to pay attention to. You can have all of the advanced security features and rapid load times on God’s green earth, but if your site isn’t live, it won’t matter because nobody can see and experience it. Your page loading time is one of the single most important factors in maintaining a high-quality and user-friendly website. According to market research, if your website doesn’t load within 5 seconds, you will lose more than 74% of your mobile site traffic! Conversely, by decreasing your page load times, you can increase traffic and conversions by more than 74%. Coincidence? I think not! Luckily, if you choose to trust HostGator Cloud with your web hosting, you’ll never have to worry about losing a potential customer to sluggish load times again. With a speed less than 419 ms (more than 50% faster than the industry average of 890 ms), HostGator Cloud is one of the fastest and most affordable hosting providers that we’ve ever reviewed. Unlike many of the other hosts we’ve reviewed on this site, HostGator Cloud has managed to provide a service that is both stable and fast, ensuring a great customer experience for you and a phenomenal user experience for your audience. Considering the improved performance and additional features (which we will get to in a second) that come standard with HostGator’s Cloud hosting plan, their basic pricing tiers are fairly competitive. 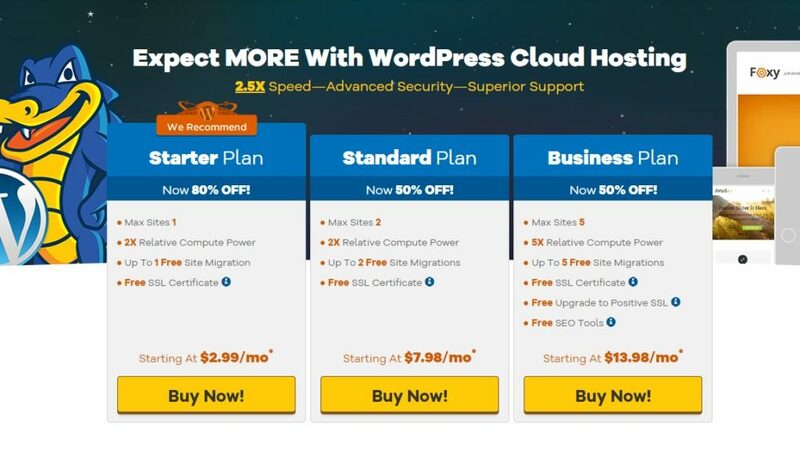 With prices ranging from $4.95/mo for the basic plan all the way up to $13.98/mo for their most premium package, HostGator’s Cloud package is far more affordable than the majority of the 30+ web hosts that we’ve reviewed in the past. HostGator has been generous enough to provide readers of our site with an exclusive discount that allows you to get HostGator’s Cloud hosting for only $2.99/mo. P.S. This price only applies for 1, 3 or 6-month plans. After that, you need to pay the regular price, which is $14.95. However, it’s wise to opt in for the 3-year plan, so you can save a lot of on your renewal fees. If that’s not enough, you can also get a new domain name for only $0.01 for 1-year. Anytime you can secure a web hosting package with incredibly reliable uptimes and fast load time for only $3/month, it sounds like a good deal to me. Unlike any of the other hosts that we’ve reviewed, HostGator does allow you to pay for a 1 or 3-month subscription. Now, remember – because this deal is so low (and is only available for a limited time), you’re better off locking in this rate while you still can. ‘Bandwidth’ is an incredibly important part of a good hosting provider. As is ‘disk space’. If you ask ten different people to explain what it means in plain English, you’ll get ten different, jargon-filled answers that will probably make your ears bleed and your eyes glaze over. Words like “net bit rate”, “throughput” and “throttling” leave their lips and you’ll be left with little-to-no mental bandwidth (pun very much intended) to process what the heck just happened or what exactly you’re paying for with your soon-to-be hosting provider. Mercifully, HostGator’s website and sales copy understand your plight and explain, in Layman’s terms, exactly what you’re getting with your subscription. Furthermore, navigating their front-end site and control panel is a breeze. Even the most novice webmaster can quickly find and change important features, integrate useful applications, and make changes to account settings. HostGator instead uses clear terminology like ‘max sites’ and ‘monthly traffic’ to give even the most basic prospect a clear understanding of the bang you’re getting for each buck. And if you get stuck, their live support (detailed below) is available 24/7 and they have a deep library of support tutorials, FAQs, and other troubleshooting documents available. HostGator throws in a bunch of extras on their plans that push their offer over the edge. ✅ Free Migrations: One of the most notable features that HostGator Cloud offers is free migrations. Unlike BlueHost, which charges nearly $150 per migration, HostGator Cloud will transfer your site over completely free of charge. No nasty loopholes or upcharges included. ✅ Daily Backups: With a few mouse clicks, you can quickly set up full daily backups that will automatically store previous versions of your site so that, if and when the stuff hits the fan, you can quickly and effortlessly get your website back online and avoid the dreaded white screen of death. ✅ Automatic Malware Removal: One of the only notable problems with WordPress sites is that the sheer number of available plug-ins and third-party tools open every WordPress user up to potential security concerns from hackers and cybercriminals. Luckily, in the (inevitable) event that your website is infected with some form of Malware, HostGator will pitch in, help you put out the fire, and get back to business as usual. ✅ Global CDN: Content Delivery Networks help take all of your large files like images and video off your site so it doesn’t get bogged down by requests, and instead delivers them to customers using tiny little magic fairies closest to their location to make load times blazing fast. ✅ WPPro Developer Help: Another perk that is unique to HostGator Cloud is access to their WPPro Developer Help which includes access to comprehensive WordPress beginner training and a network of trusted professionals to help you troubleshoot a wide variety of different issues. For the non-tech savvy webmasters among you, this can be a HUGE perk in the event that you run into a technical issue that is beyond your skill or understanding. No more slumming around Craigslist to find shady “WordPress Experts” to help resolve your issues. ✅ Storage: The vast majority of basic shared hosting providers give you a couple of gigs of storage for uploads, for example, a video (singularly). HostGator sets itself apart from the competition by including unmetered storage on all of their cloud plans. No… I’m serious! As I’ve mentioned throughout this review, HostGator’s customer support is one the best in the industry. Their 24/7 live support team is available through phone, email, and their hyper-responsive live chat option making customer support queries a fast and painless experience (which is not the industry standard in case you were wondering). 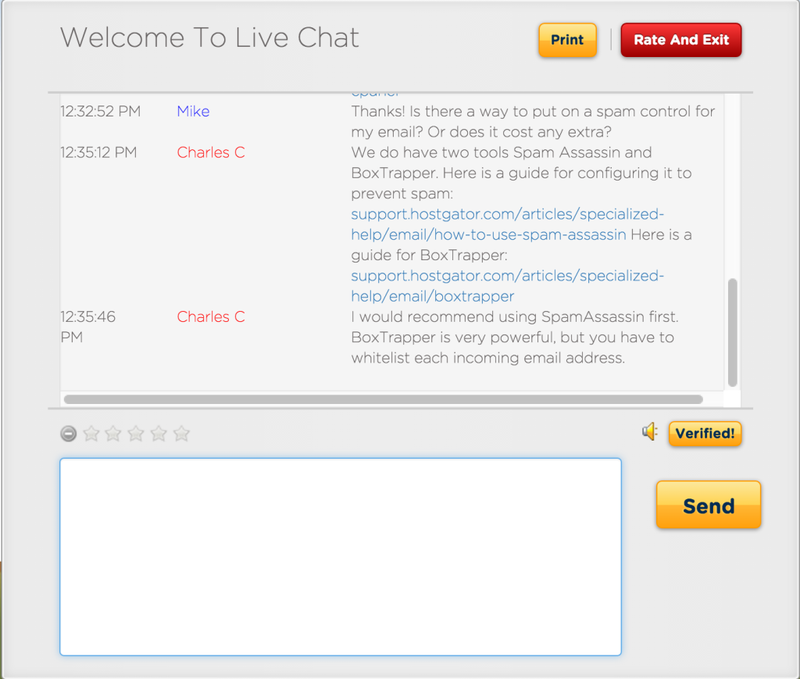 A chat with “Charles C” who is HostGator support agent. I submitted several support inquiries over the past 8 months and every single one of them was handled quickly and professionally. In case you haven’t noticed, we’re a big fan of HostGator’s Cloud service. With the unbridled speeds, reliable load times, and savvy customer support, it’s hard to find much to complain about. There are a couple of minor drawbacks to consider (although you might be able to avoid one of them). Most web hosting companies are notoriously frustrating with how they explain and promote their pricing. HostGator Cloud is just as guilty of this. For example, if you’d like to take an advantage of the mouth-watering $2.92 deal on their site, you can only sign up either monthly or 1 year upfront. If you want more than 1 year, you’d have to pay $5.48/mo – which would be a deal-breaker, right? The good news is that our special deal can help take the sting out of a longer commitment, with such a low price that you’d be actually better off locking in that unbelievable (and time-limited) rate. If you aren’t a fan of live chat, email, or phone support (a confusing stance to say the least), then you will likely be disappointed by HostGator’s lackluster social support. Unlike many of their competitors, HostGator doesn’t appear to be very active on their social channels and you probably won’t receive any sort of response if you submit an inquiry on Twitter or Facebook. While this certainly shouldn’t be considered a deal breaker, it’s definitely a point to consider. Starter Plan: This plan starts at $2.99 per month. It supports 1 site, 25k visits per month, 1GB backups, and unmetered storage. <- We used this plan for our test site. Standard Plan: This plan starts at $7.98 per month. It supports 2 sites, 200k visits per month, 2GB backups, and 150GB storage. Business plan: This plan starts at $13.98 per month. It supports 5 sites, 300k visits per month, 3GB backups, and unlimited GB of storage. Ease of Signup: Signup process is a breeze! Payment Methods: You can pay by credit card or PayPal. Hidden Fees and Clauses: The only major ‘gotcha’ is a restriction that you can’t tap over 25% of their system for over 90 seconds. Upsells: There are some upsells along the way. Account Activation: It might require up to 24-48 hours for accounts to be activated in some cases. Installation of Apps and CMSs (WordPress, Joomla, etc. ): Extremely easy, one-click installation process of the most popular apps available. Do We Recommend HostGator Cloud? The entry-level, shared hosting options from HostGator we previously reviewed weren’t that great. However, these upgraded Cloud hosting options are AWESOME. Between the impressive uptimes, our insanely low $3 dollar deal, the user-friendliness of their site and all the outstanding extras, this really is one of the best places to host your WordPress website. No further reading required. Just click here and sign up. P.S: If you’ve used HostGator Cloud, please consider leaving a review below – good or bad – doesn’t matter. Thanks for your support! Hostgator as the service provider has a clear record of powerful servers situated in superb data centers all over the world. Most of the users have a positive opinion towards the performance of Hostgator servers, and Hostgator powered websites as well as blogs have an enviable PageSpeed in different measures. This is one of important point to consider about Hostgator’s services would be able to satisfy every internet marketers who are concerned about seamless working of their websites. Even if you have chosen the more economy plans of Hostgator, your site will always show awesome performance. You can try a product many times before you actually buy it. This level of convenience has been hailed for a short time, and it helped enormously people in their purchasing decisions and has also contributed to the strong relationship between the producers of online products and potential customers. Hostgator 1 cent coupon is the best possible web hosting discount available in the market for web hosting services, also their service is supported for all around including CMS, WordPress which is claimed to be the best CMS out there. Hostgator are actually good to my liking and I do say I enjoy their service at one of my client’s websites and blogs. I purchased a shared hosting for their company and over 3 years they have been having a good time with their blogs. All customer service is always active and ready to assist 24/7. What I value much about them is their free live chat customer service which is one way to resolve your complaints. So I don’t see any reason why people are rating them below their limits. I love their service, because it is good. I started my account with HostGator when I was still learning HTML/CSS and wanted to publish my first website I was proud of. I am still hosting to this day. Their support is very helpful, one time I was in need of assistance with a SSL certificate and the chat literally went on for over 2,5 hours. Only downside I can think of is that sometimes their live chat is super busy and it can take a while before you can connect. Also 2 times my domains did not register correctly. Other than that the best web host in my opinion. Tried to set up a simple WordPress site via this Cloud package and in all honesty I’m surprised at how much hard work it was. All of the automated emails seem to be for the old system as they don’t tie up with what actual happens in the customer portal. It also didn’t link the fact that I’d registered a domain at the same time so there were other emails about that. It then turns out that you can’t change the URL in the WordPress settings so you are stuck with http:// version, no www. Not a major issue in many ways but not mentioned anywhere and a bit of an odd restriction. Talked to the support team, one of whom advised me to uninstall WordPress and start over, the other of whom said it was all the same and it didn’t matter and insisted on calling me “bud”. Can’t tell you what the actual hosting is like unfortunately, because I gave up and moved elsewhere. I am not a very big fan of Hostgator. There are too many negative reviews about their poor speed and slow support on the internet. Even Hostingfacts does not recommend their regular shared hosting plans. But, their cloud hosting has been a pleasant surprise for me. Little to no uptime, fast speed and friendly support staff is something, due to which I have decided to stay with them even after 10 months. Otherwise, I would have transferred to Siteground (I like it a lot) at any point of time. Hostgator Cloud is different, it is better and deserves the crown for this drastic improvement. You’re only allowed to have 1 domain with the WordPress cloud hosting starter plan. The renewal rate is $9.95 which is pretty expensive when you consider other services and other plans give you unlimited domains. If you avoid the WordPress plans and choose the baby cloud plan you get unlimited domains for $7.95 and $11.95 renewal. $2 more for unlimited domains. You should get a baby cloud discount instead. I have been a customer of Hostgator for some time now. I have upgraded from Hatchling to Cloud Business. The speed of my 2 mb website has been good and all issues on our site have been handled professionally and pagespeed / onpage results are just fine. I used your discount and signed up with them 3 months ago. So far, so good. Not a single problem. I used to use Site5, but I discontinued using them as I felt the uptime was too bad. Hence the reason I switched. Overall, HostGator Cloud is a great host. I’ve been using Hostgator for just under a month and today I received a “500 Error” and my site completely shut down. I called their tech line and they said I had exceeded my bandwidth. Not Cool! However, after I contacted the support they quickly fixed it. Hands down – their support is good. I signed up for HostGator cloud back in June. So far, everything is working properly. Uptime seems to be 100% and load times are much faster than my previous host (Site5). I haven’t had a chat with their support (yet), so I can’t rate this. I am quite new to the blogging world. When I finally have the courage to create my own, I chose HostGator due to the reviews on this site. Yep. HostingFacts.com helped me with choosing my host, and I am quite satisfied. One thing I liked about HostGator very much is the support. Being a new blogger, I am quite slow and still learning about it. HostGator is such a huge help. I recommend this to new bloggers, and although the price is higher than most hosts, this one is worth the money and will leave you satisfied. I’ve started my blogging journey with the regular HostGator shared hosting. It worked great for me until my blog started getting high traffic. I’ve faced several downtimes on HostGator and moved to Bluehost shared hosting. My experience with Bluehost shared hosting wasn’t that good. And I decided to upgrade to Bluehost Managed WordPress Hosting. I didn’t find any difference. Believe me. I bought HostGator Cloud hosting on last black friday and I’m still using it. It’s far-far better than Bluehost or GoDaddy (I’ve used them both). So far, I haven’t faced any major downtimes with HG Cloud Hosting. Thumbs up for this!